Taking a quick break from the business-related posting we usually do to salute Lance Armstrong on his record-breaking seventh To ur de France championship. Unbelievable. During this tour (and the last couple) I regularly woke up around 6:30a to watch Lance put the screws to the competition. This year was no different, although there were fewer moments of excitement than some years past. In 2002 while living in Switzerland during my tenure with CNET, I was fortunate enough to be able to catch a leg of the tour just across the border in France. 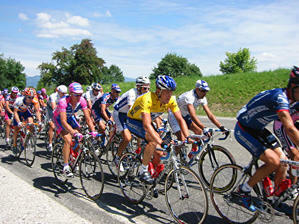 The picture you see here was taken as Lance and the Peloton rode by. He's wearing the Maillot Jeune but you wouldn't expect anything less. Hopefully I'll find a way to get him to sign the original photo some day. Best of luck to Lance on his new life. I'm really looking forward to next year's event to see how the field reacts to no Lance in the mix, and to see if Ullrich, or Basso, or one of the other big riders is able to grab championship.